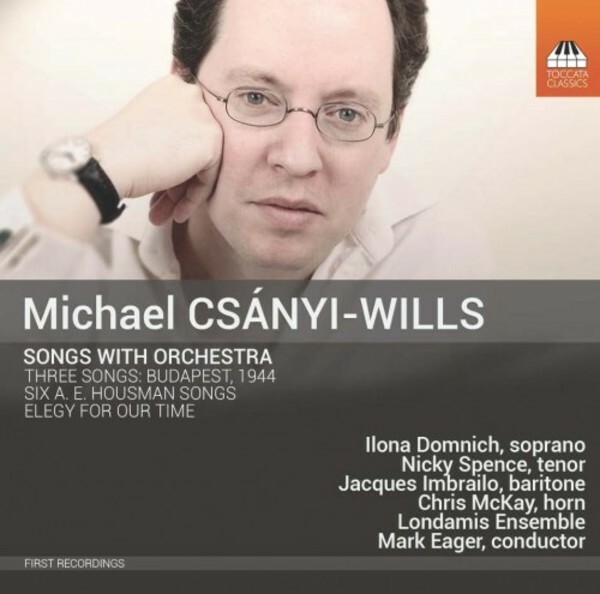 These orchestral songs by the English composer Michael Csányi-Wills (b.1975) – best known for his film music – all deal with the subject of loss. In Three Songs: Budapest, 1944, Csányi-Wills uses documentation from his own family history to shadow the fate of Hungary’s Jews under the Nazis. One of them, ‘The Last Letter’, sets a text written by his great-grandmother before she disappeared. Mortality is an omnipresent theme in A E Housman’s Shropshire Lad poems: Csányi-Wills sets six songs, three for baritone and three for tenor. Elegy for Our Time sets an anguished lament by Jessica d’Este, sparked by the death of her granddaughter in a car crash. Csányi-Wills responds to the stimulus of these dark texts with music that is hauntingly lyrical and elegiac. Ilona Domnich, who studied at the Royal College of Music in London, has performed at the English National Opera, Buxton and Grange Park Opera and in music festivals in the UK and Europe. Jacques Imbrailo studied at the Royal College of Music. His 2010 Glyndebourne Festival debut in the title role of Billy Budd was described by The Financial Times as ‘the finest Billy I have heard – lusty, virile, sensitive and moving’. Nicky Spence, who studied at the Guildhall School, created one of the leading roles in the world premiere of Nico Muhly’s 'Two Boys' for the English National Opera. Mark Eager is Principal Conductor and Artistic Director of The Welsh Sinfonia. The Londamis Ensemble makes its first appearance with this recording.